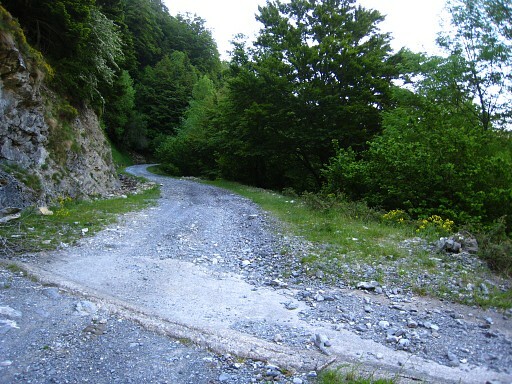 A nice and varied walk on forest roads with an alpine finish when climbing the Pic d'Orhy, your first 2000m barrier. Wayfinding: no problem. Both variants include crossing streams and climbing steep forest hills. The first covers bm231-232. The second bm234-234bis and requiring a bit more orienteering. 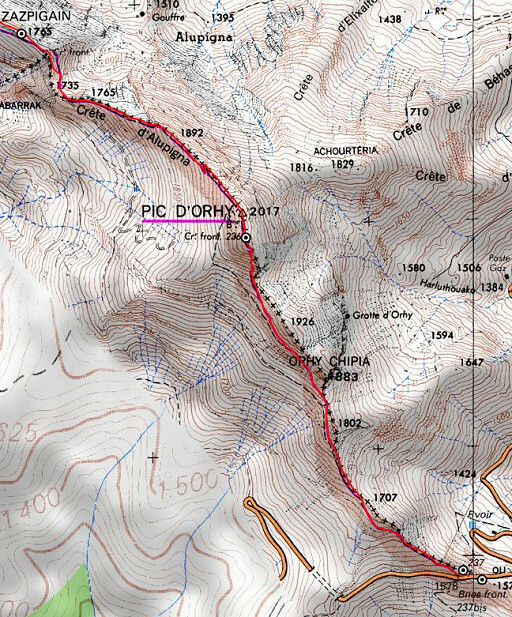 There's a risky passage 15om beyond bm235 with a steep & slippery descent before you continue to climb the Pic d'Orhy. Be careful. 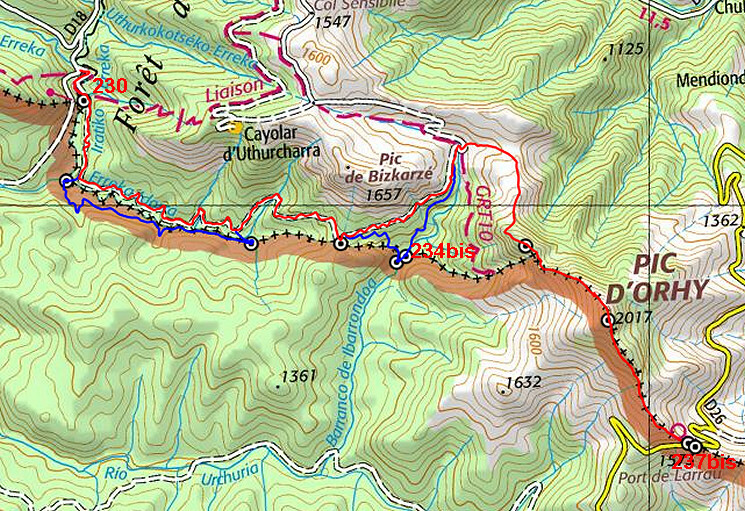 On the main route there's water supply and nice bivouac-possibilities near the cabin of Cayolar d'Ibarrondoua. There are more water-resources along the variants. At the end of this stage - at Port de Larreau - there's no water nor proper bivouac-spot. 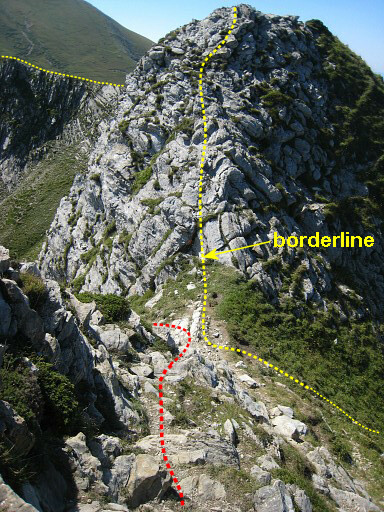 But 4km further on the borderridge - between bm241 and 242 - you could descend 1,5km N to a stream. - km & elevations statistics computed in Basecamp. 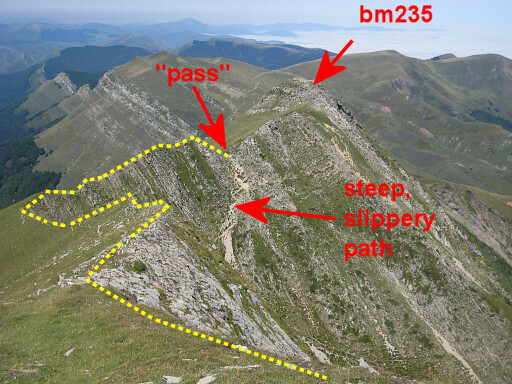 From your starting point it's an easy walk S.
Bm230 is downhill but easy to find. 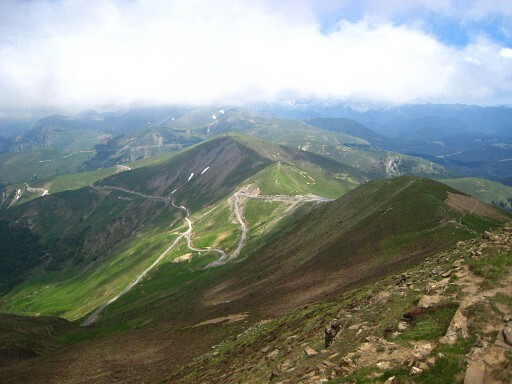 Then - after 1,1 km - the dirtroad bends E. That's where variant 1 starts. 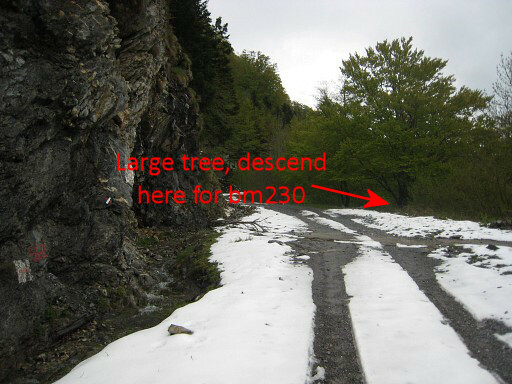 And this is the large tree where you can descend to bm230. 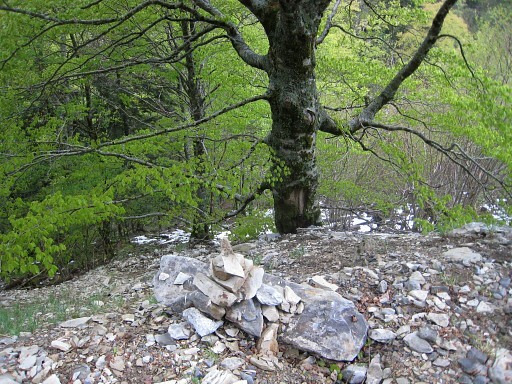 Note the cairn in front. 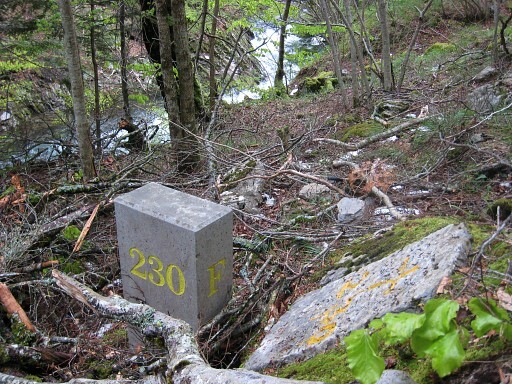 Bm230 is ± 50m downhill (15m elevation) and consists of a newer pillar besides the old - and still intact - cross. Climb back to the dirtroad and continue S for 1,1km to where the dirtroad bends E.
Just before that bend to the E, a trail descends to the right to the river. That's the start of variant 1. The main route continues E on the winding dirtroad. As said: on the bend of the dirtroad to the E, there's a distinct path/road descending to the river, to a confluence of a stream and this river. 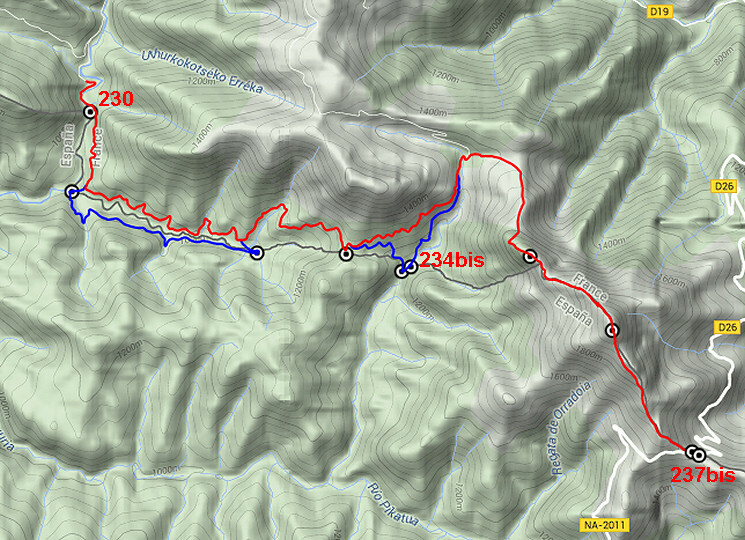 After crossing the stream and climbing to the dirtroad, it's a 2,5 km walk to the E to the end of the dirtroad. 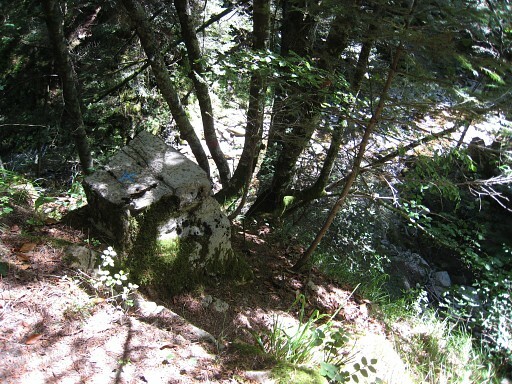 Bm232 is then 200m further at the end of a trail. Bm231 is standing above the confluence and along the path before its final descent. This is the confluence. At the time of this picture, the stream was swollen by rain and the melting snow but still manageable. It's easy to cross the stream via the tiny island in the middle. On the other side, climb S uphill in 100m to a forest road. Then follow that dirtroad E for 2,5km until it ends. 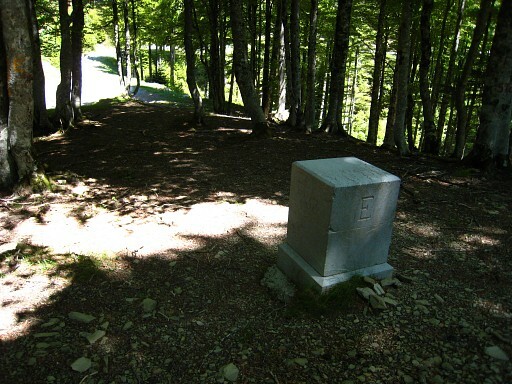 From that road's end, a yellow waymarked path continues E for ± 200m. To the left down below is still the stream which is the border. 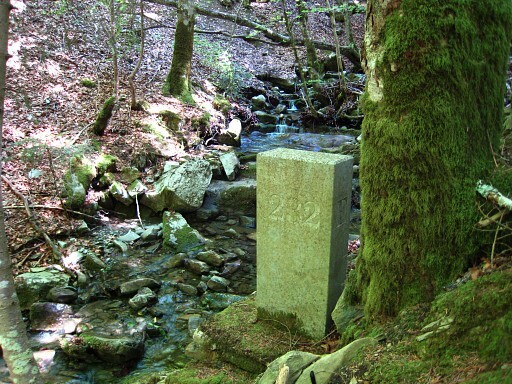 After passing a streambed which descends from the S, bm232 is nearby on the S-side of the borderstream. 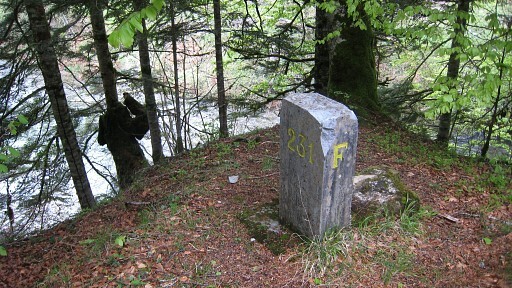 Bm232 is more or less at the SE corner of the streambed coming from S and the borderstram. This map shows approximately how to continue and join the main route again on the dirtroad at the French side. That means climbing though the forest (no trails). At the dirtroad continue to the E, following its windings as show on the map. 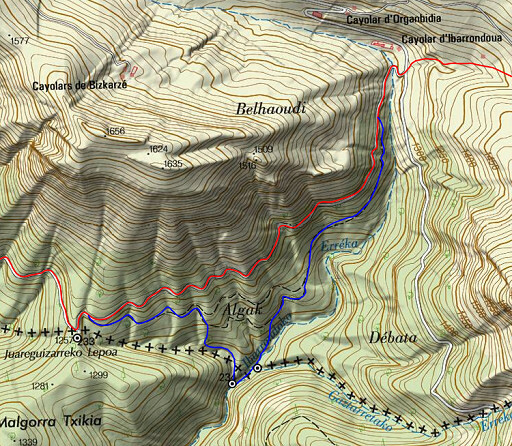 After ± 2km you will arrive at an pass which is called Juareguizarreke Lepoa at the Spanish map. At that pass, go 30m S to reach bm233. Bm233, looking back to the dirtroad. 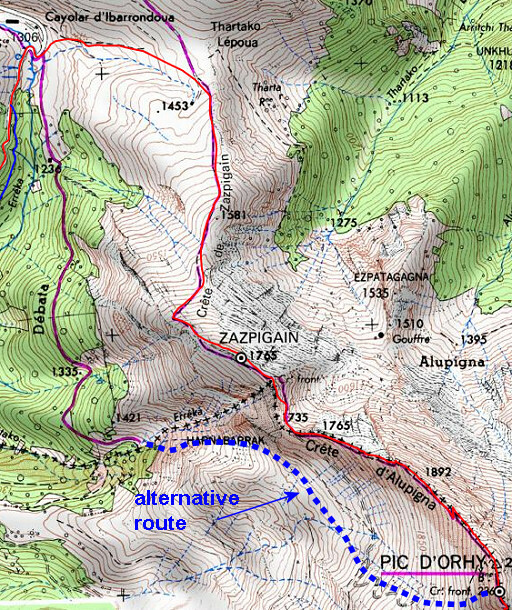 The main route continues on the winding dirtroad for another 2km before arriving at open terrain near somes cabins. 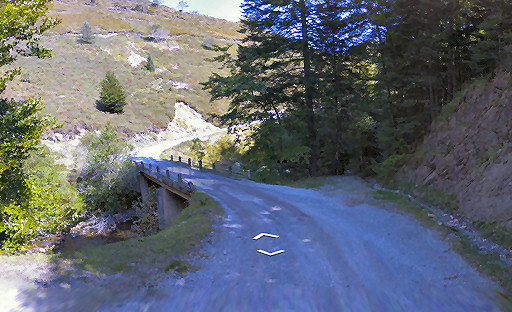 About 100m beyond the pass near bm233, a forest road descends to the right from the main dirtroad. Descend on that winding forest road for 500m until a bifurcation. This IGNes-map shows that bifurcation better. 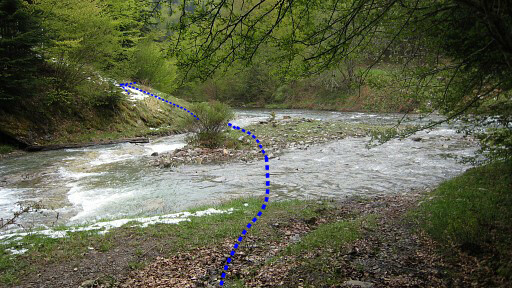 Take the branch to the right for ± 150m and then leave it, going S downhill towards a stream (= the border). Don't descend to the stream(bed) itself but keep above it, following its course E-S until the confluence of the borderstream with another stream. Since you didn't descend to the stream itself but stayed above it, you will end above the NE-corner of that confluence. And that's where bm234 is placed. Thus: not at the confluence itself but high above it at its NE-corner. Bm234 seems damaged, there's no number, only a cross engraved on top of it. 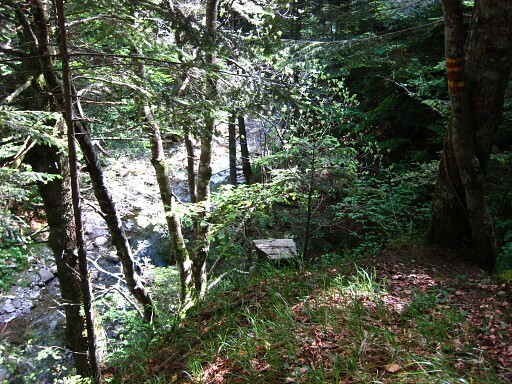 Then continue NE along the river for ± 125m until a stream from the right merges with the river. In the NE-corner of that confluence - a bit higher - you will find bm234bis. Like bm234 there's a cross engraved on top but this one has also a number (painted). Return to the confluence of stream and river. 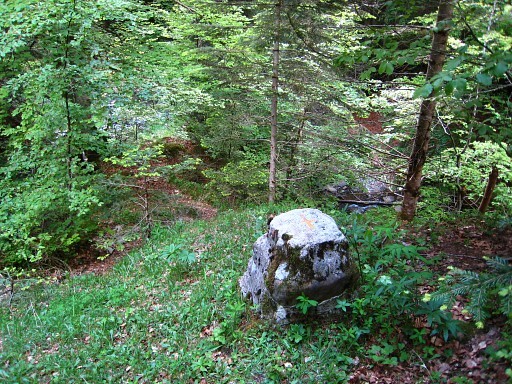 Continue ± 100m NE upstream along the river and then start climbing the left hillside to the NNE. 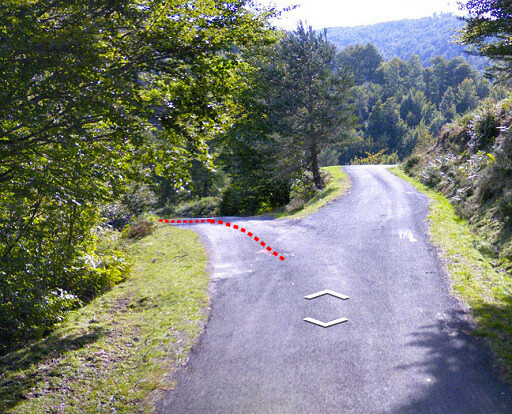 After 150m (and 40m elevation) you will arrive at a forest road. That's the same forest road you left earlier to descend to bm234. 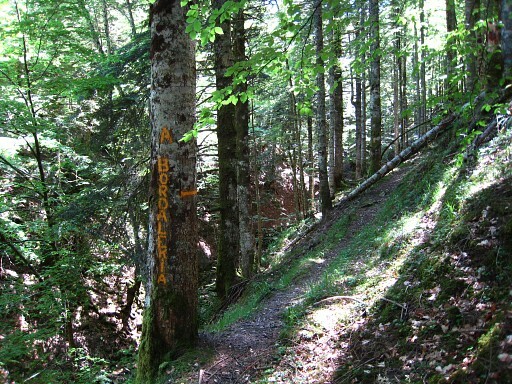 Follow that forest road to the N. After 1,2 km you will join the main route. 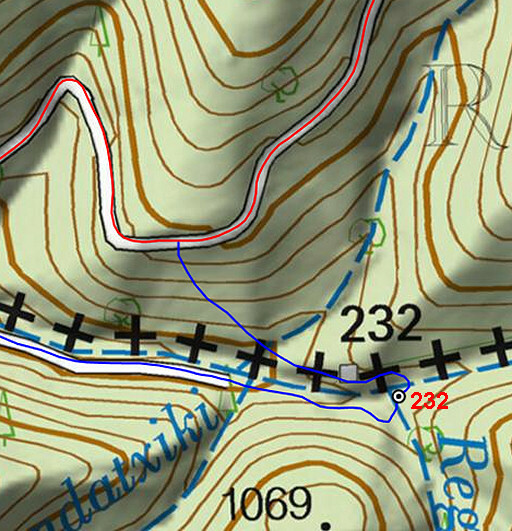 The rest of this stage is easy in navigation as it is mainly on the mountainridge. 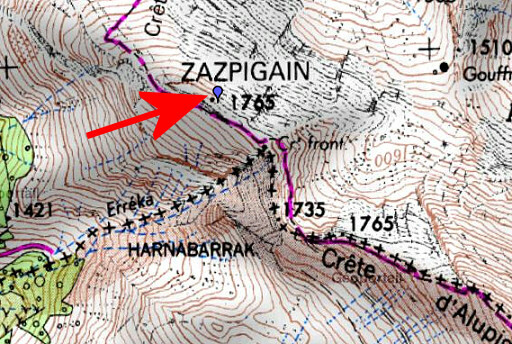 The route from the cabin of Cayolar d'Ibarrondous to the mountainridge is easy and well visible on this Google Streetview-map. You have to climb SEE along a sort of stream-bed or cleft to the hillridge. At the hillridge, go to the right. You will pass hunter's shelters. This picture: passing the last of the shelters. The Pic d'Orhy is visible in the far distance. 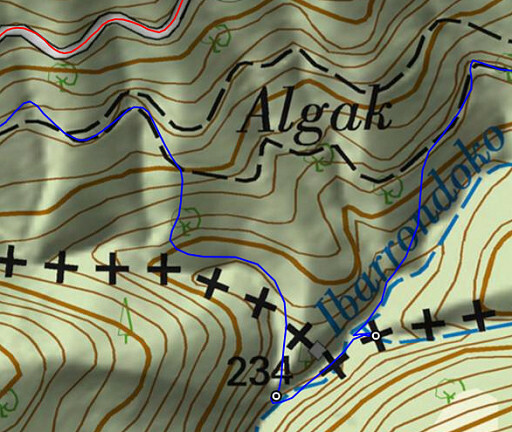 The hill-ridge becomes a rock-ridge with some trails underneath. This picture: looking from approximately the summit of Zazpigain along the borderridge towards Pic d'Orhy (in the clouds). 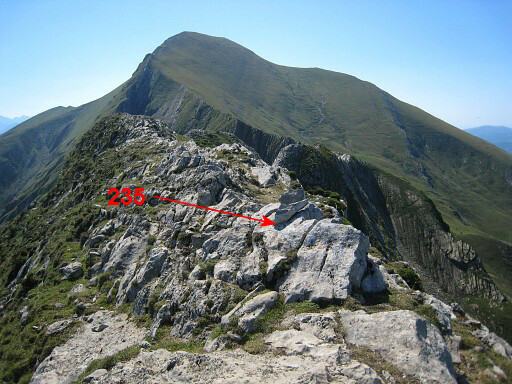 On this IGN-map the location of bm235 (red arrow). The borderline on this map is drawn exactly according to the Procès-Verbal but the "Cr. 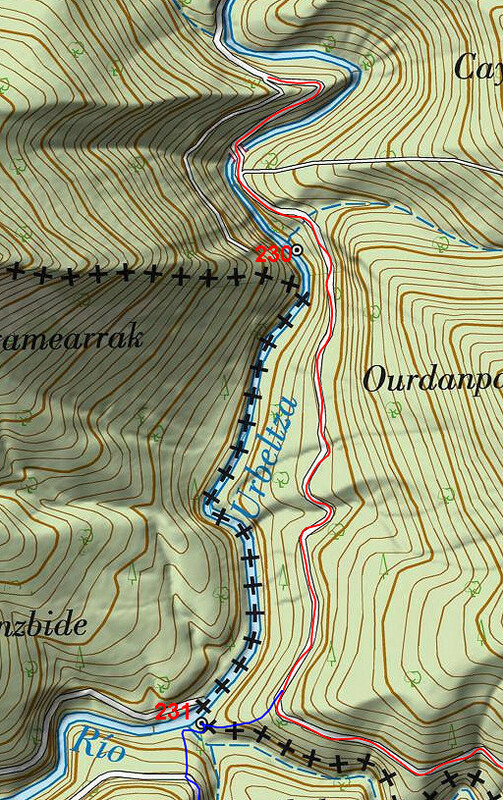 front" (bordercross) has been engraved at a wrong spot: ± 150m to the NW. Zoom-in of the previous picture. 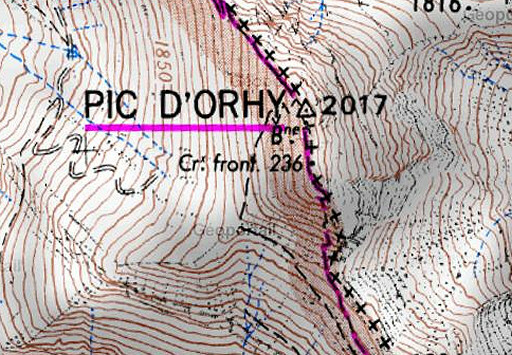 And - looking S - to a sort of pass where the borderline - having come from bm234bis - continues on the mountainridge towards Pic d'Orhy. 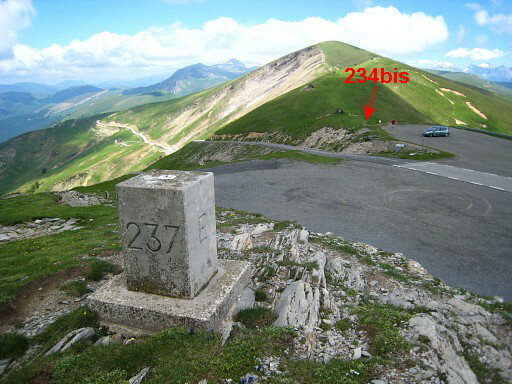 The treaty says that bm235 was engraved here and the French IGN-map confirms that. But in reality it's ± 150m to the NW. The ridge ahead becomes soon too sharp to walk over. You have to descend here to the left on a short but steep & slippery trail and then climb back to the ridge further on. But what to do if that slippery & steep descent is too much for you? 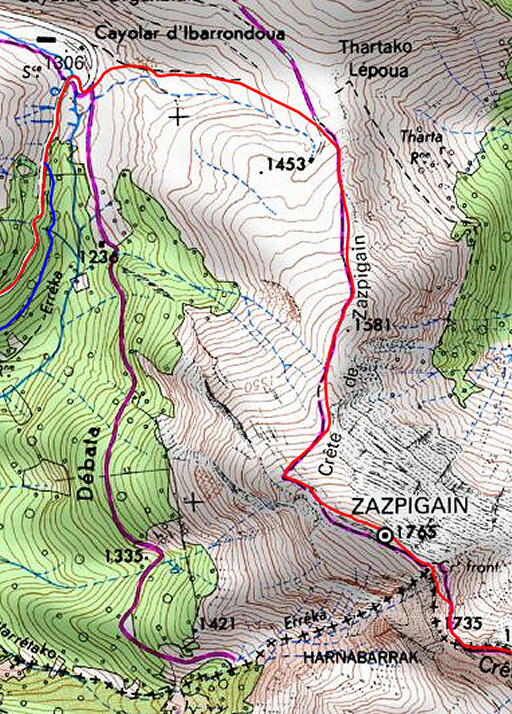 There's only one solution: return all the way to the cabins (Cayolar d'Ibarrondoua) and go S on a dirtroad (purple trail) until it ends at the borderline. 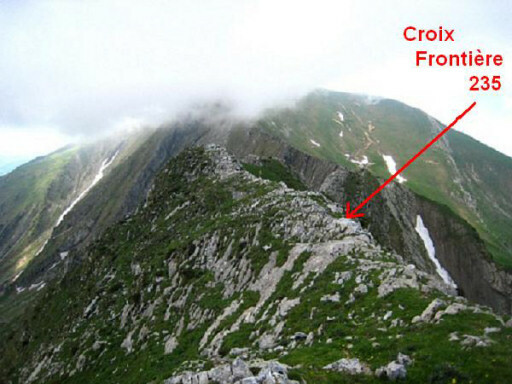 Then climb uphill on the grass (not trails) to Pic d'Orhy as shown on this map. The last part of this stage. 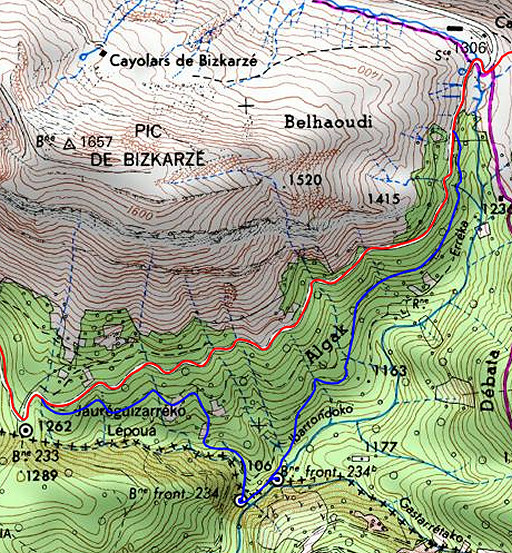 After the slippery descent and back at the ridge, you can in general stick to the borderridge until Port de Larrau. The slippery descent requires special caution but climbing back to the ridge is easy on a well trail. This picture: looking back. You can see the slippery (whitish) descent and the more gentle climb to this gate. From the gate, climb uphill along the ridge on a trail. This picture, taken higher on and looking back at the ridge. It's a tough climb uphill to Pic d'Orhy. 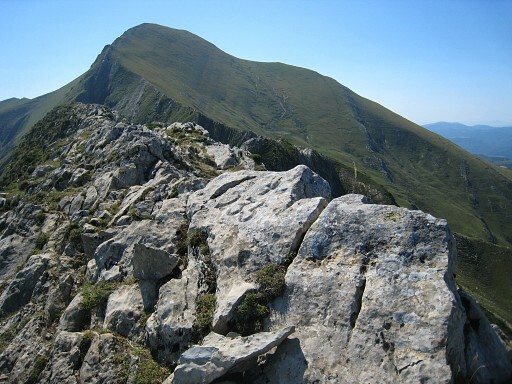 Having arrived at the top at the geodetic marker and looking S.
The Pic d'Orhy is in fact a ridge of approximately 150 meters On the ridge there are three summits. This is the northern one with the geodetic pillar. 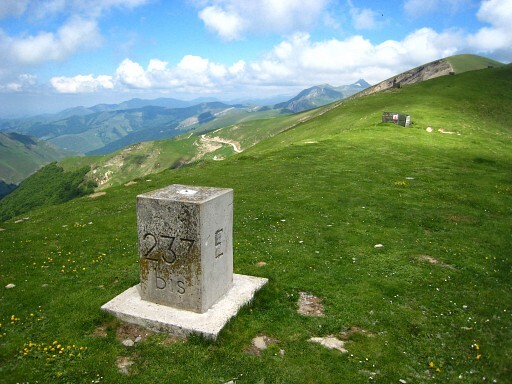 The middle and southern summit are well visible. 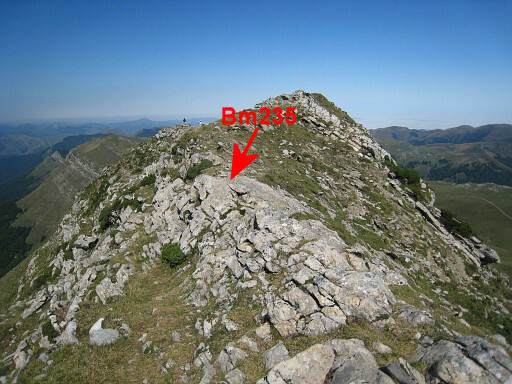 Bm236 was once engraved somewhere on this ridge but has vanished since long. Or it's still somewhere there but hidden. According to the gps, there‭’‬s a slight height difference between the‭ ‬3‭ ‬pics‭: from N to S:‭ ‬2010m‭ ‬-‭ ‬2011m‭ ‬-‭ ‬2012m. 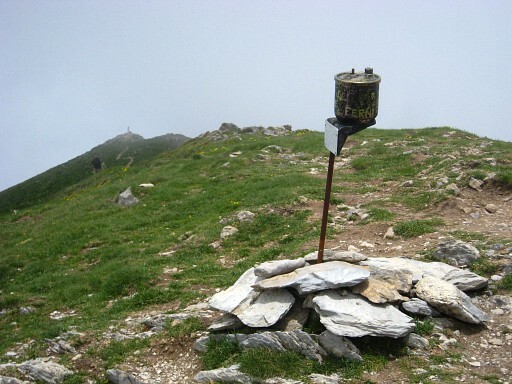 So: the southern summit is the highest summit of the three. That's in accordance with the altitudes on the Sitna-map. 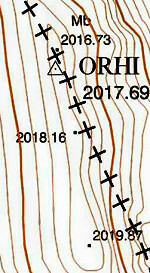 ‭ ‬So the southern one should be considered as the real Pic d‭’‬Orhy but the maps locate Pic d'Orhy at the northern one. 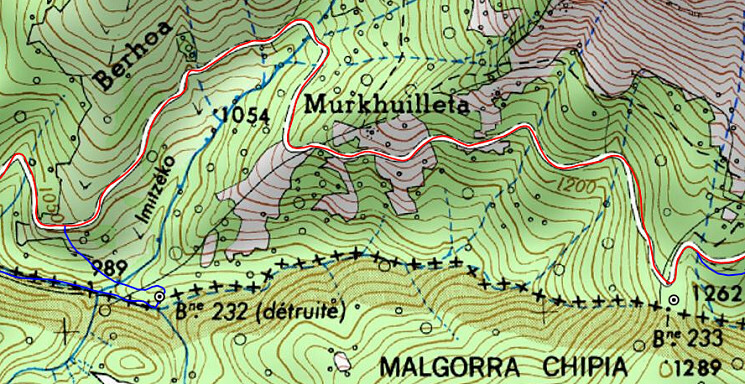 Anyway: the French IGN-map locates bm236 between the middle and the southern summit but we don't know if that is according to the reality (in the past). 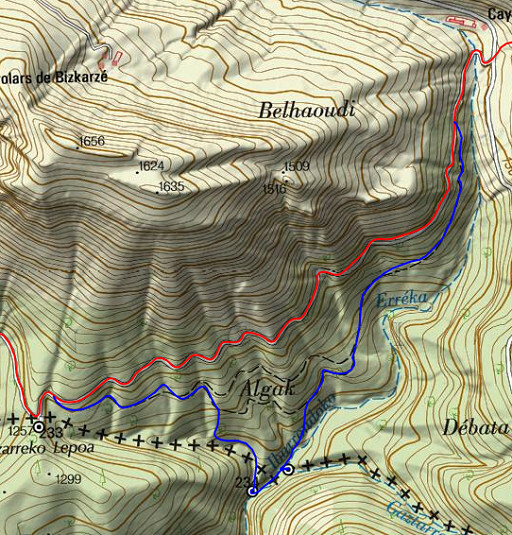 The French map (left) is quite vague but the Sitna-map (above) shows the three summits very clear. 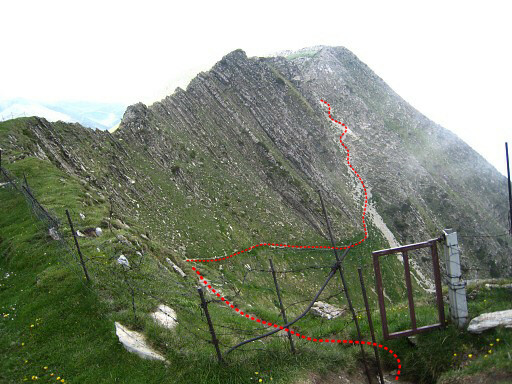 This is the southern summit with a metal pole ("piquet"), looking back. 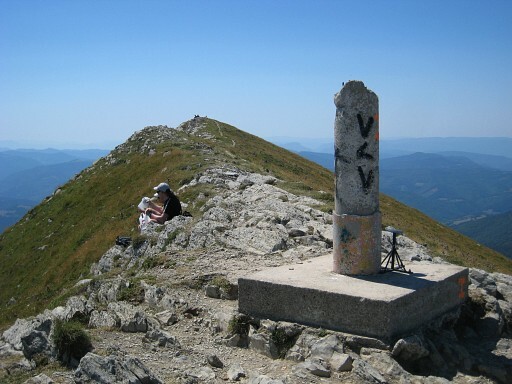 Visible in the distance: the geodetic marker at the northern summit. 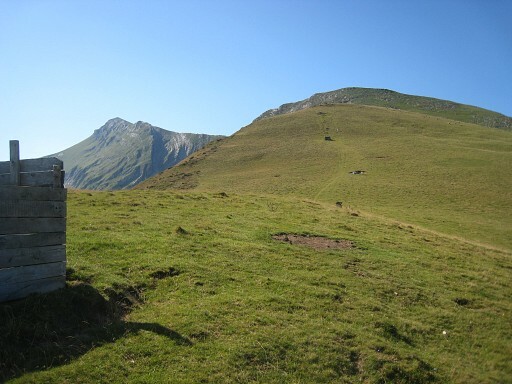 Then descend on well trails to Port de Larrau which is already visible on this picture. Having arrived at Port de Larrau. Bm237bis is at the other side of the road. As said: this is not an obvious spot for a bivouac. Moreover there's no water here. 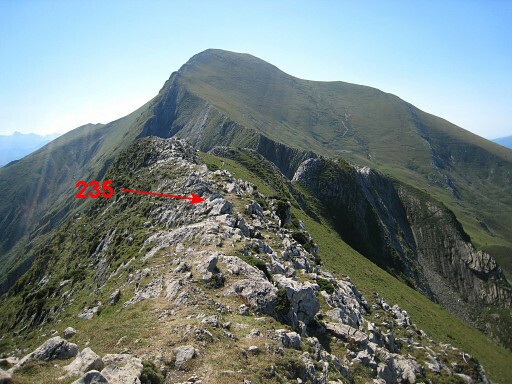 But 4km further on the borderridge - between bm241 and 242 - you could descend 1,5km N to a stream.